Home / Dining in Palo Alto - CA / Lemonade Opens in Palo Alto — And You Can Taste it First! 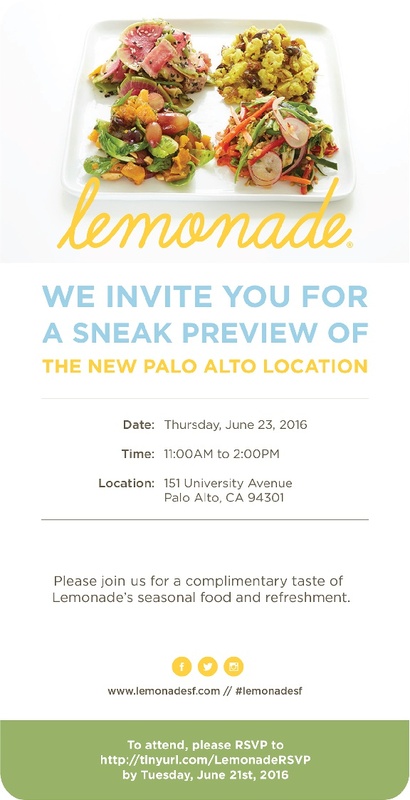 Lemonade Opens in Palo Alto — And You Can Taste it First! Lemonade is a Southern California cafeteria chain that’s expanding into the Bay Area in a major way! The Yerba Buena location is already open but five more are scheduled to open soon….and the one in Palo Alto (151 University Avenue) as soon as tomorrow! This is your chance to try it — for free! — before everyone else in the Bay catches onto how delicious, and affordable, Lemonade’s food is. You’ll even beat me, as I’ll be checking it out at the VIP dinner a few hours later that same day. Cafeteria doesn’t imply the freshest foods, but Lemonade had turned the concept on its nose, offering inventive salads, sides, and entrees made with quality, seasonal ingredients. I’ve hit it up a few times on visits down south, and you will want to as well! So how do you get your free lunch? The first ten readers of the Gourmez to click this RSVP link will get a free lunch on Lemonade anytime between 11 am and 2 pm tomorrow at their new Palo Alto location. Just fill out the form and go! Or fill out two forms if you want to bring a friend. Tell ’em I sent you. 😉 I just always wanted to say that. Don’t forget to try one of their many lemonade varieties–there’s a reason that word is their name! And don’t worry that it says to RSVP by yesterday. You’re still good today, as long as you’re one of the first ten to sign up. Happy eating!